Henry (Harry) Patch, the son of a stonemason, was born in Bath, on 17th June 1898. He attended Coombe Down School and later recalled: "I was fifteen when I left, but I continued to study afterwards. At eighteen I sat for the registered plumber's certificate." Patch's older brother was in the Royal Engineers and took part in the early stages of the First World War. He was badly wounded at Mons and was invalided out of the army. "He told me what the trenches were like, and I didn't want to go." Harry Patch was conscripted in October 1916. After six months at Sutton Vealey with the 33rd Training Battalion, he was sent to the Western Front where he was put on the Lewis Gun. "I'll always remember morning inspection in the trenches. That was very severe. They used to come round and your gun had to be clean, well oiled and loaded." In June 1917 Patch was promoted to the rank of lance corporal in the Cornwall's Light Infantry. He was at Passchendaele but did not go over the top until a few weeks later at Pilckem Ridge. "I can still see the bewilderment and fear on the men's faces as we went over the top. We crawled because if you stood up you'd be killed. All over the battlefield the wounded were lying there, English and German, all crying for help." Patch later described how one German attacked his Lewis Gun. "He couldn't have had any ammunition or he would have shot me, but he came towards me with his bayonet pointing at my chest. I fired and hit him in the shoulder. He dropped his rifle, but still came stumbling on. I can only suppose that he wanted to kick our Lewis Gun into the mud, which would have made it useless. I had three live rounds left in my revolver and could have killed him with the first. What should I do? I had seconds to make my mind up. I gave him his life. I didn't kill him. I shot him above the ankle and above the knee and brought him down. I knew he would be picked up, passed back to a POW camp, and at the end of the war he would rejoin his family... We never fired to kill. My Number One, Bob, used to keep the gun low and wound them in the legs - bring them down. Never fired to kill them. As far as I know he never killed a German. I never did either. Always kept it low." On 21st September, 1917, a shell hit Patch's Lewis Gun. "The shell that got us was what we called a whizz-bang which burst amongst us. The force of it threw me to the floor, but I didn't realise I'd been hit for a few minutes. The burning hot metal knocks the pain out of you at first but I soon saw blood, so I put a field dressing on it.... I didn't know what had happened to the others at first, but I was told later that I had lost three of my mates. That shell killed Numbers Three, Four and Five. We were a little team together, and those men who were carrying the ammunition were blown to pieces. I reacted very badly. It was like losing a part of my life. It upset me more than anything. We had only been together four months, but with hell going on around us, it seemed like a lifetime." Patch later recalled: "I'd got this piece of shrapnel right in the groin. It was about two inches long, half an inch thick, with a jagged edge. I was taken to a dressing station and I lay there all that night and the next day, until the evening." The shrapnel was removed without anaesthetic. "Four fellows grabbed me - one on each arm and one on each leg - and I can feel that bloody knife even now, cutting out that shrapnel." Patch was taken to a hospital ship that took him to Southampton. The wound was so serious that he was never sent back to the Western Front. However, he was not demobilised until after Armistice Day. His experience of the First World War turned him against the idea of using force to solve international conflicts. He wrote in The Last Fighting Tommy that "politicians who took us to war should have been given the guns and told to settle their differences themselves, instead of organising nothing better than legalised mass murder". After the war Patch got married to Ada and set-up a plumbing business in Bath. He never watched a war film, or talked about his experiences, even to his wife, with whom he had two sons. He worked on a housing scheme at Gobowen, Shropshire, before being invited to work on the Wills Memorial Tower being built at Bristol University. Later he worked as a sanitary engineer. During the Second World War Patch was a volunteer fireman. He then became a maintenance manager at a US army camp in Street. As he took part in the preparations for D-Day in June 1944 he had to sign the Official Secrets Act. In 1963 Patch retired from his plumbing business. Ada Patch died in 1978. His second wife Jean died six years later. Patch did not return to Ypres until 2003: ""The idea was that I would lay a wreath to the memory of my dead friends, but I couldn't. I looked from the (coach) window and the memories flooded back and I wept, and the wreath was laid on my behalf." In 2005 Harry Patch met Tony Blair. He told the prime minister hat nobody during the First World War should have been shot for cowardice. "War is organised murder and nothing else." 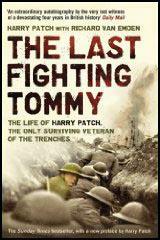 His autobiography, The Last Fighting Tommy, was published in 2007. 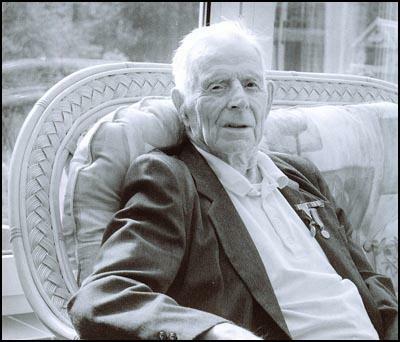 Harry Patch died aged 111 on 25th July, 2009. On my nineteenth birthday, 17 June 1917, we were in the trenches at Passchendaele. We didn't go into action, but I saw it all happen. Haig put a three-day barrage on the Germans, and thought, 'Well, there can't be much left of them.' I think it was the Yorkshires and Lancashires that went over. I watched them as they came out of their dugouts and the German machine guns just mowed them down. I doubt whether any of them reached the front line. A couple of weeks after that we moved to Pilckem Ridge. I can still see the bewilderment and fear on the men's faces as we went over the top. We crawled because if you stood up you'd be killed. All over the battlefield the wounded were lying there, English and German, all crying for help. But we weren't like the Good Samaritan in the Bible, we were the robbers who passed by and left them. You couldn't stop to help them. I came across a Cornishman who was ripped from shoulder to his waist with shrapnel, his stomach on the ground beside him. A bullet wound is clean - shrapnel tears you all to pieces. As I got to him he said, 'Shoot me.' Before I could draw my revolver, he died. I was with him for the last sixty seconds of his life. He gasped one word -'Mother'. That one word has run through my brain for eighty-eight years. I will never forget it. I think it is the most sacred word in the English language. It wasn't a cry of distress or pain - it was one of surprise and joy. I learned later that his mother was already dead, so he felt he was going to join her. We got as far as their second line and four Germans stood up. They didn't get up to run away, they got up to fight. One of them came running towards me. He couldn't have had any ammunition or he would have shot me, but he came towards me with his bayonet pointing at my chest. I fired and hit him in the shoulder. He dropped his rifle, but still came stumbling on. I can only suppose that he wanted to kick our Lewis Gun into the mud, which would have made it useless. I had three live rounds left in my revolver and could have killed him with the first. What should I do? I had seconds to make my mind up. I gave him his life. I didn't kill him. I shot him above the ankle and above the knee and brought him down. I knew he would be picked up, passed back to a POW camp, and at the end of the war he would rejoin his family. Six weeks later, a countryman of his killed my three mates. If that had happened before I met that German, I would have damn well killed him. But we never fired to kill. My Number One, Bob, used to keep the gun low and wound them in the legs - bring them down. Never fired to kill them. As far as I know he never killed a German. I never did either. Always kept it low. Lice. We were lousy. The lice were the size of grains of rice, each with its own bite, each with its own itch. When we could, we would run hot wax from a candle down the seams of our trousers, our vests - whatever you had - to burn the buggers out. It was the only thing to do. Eventually, when we got to Rouen, coming back, they took every stitch off us and gave us a suit of sterilised blue material. And the uniforms they took off, they burned them - to get rid of the lice. For the four months I was in France I never had a bath, and I never had any clean clothes to put on. Nothing. Drink was either weak tea or water drunk from old petrol cans. As for food, we had Crosse & Blackwell's plum and apple jam and dog biscuits. The biscuits were so hard we used to throw them away. One day I looked through the metal aperture that we used to fire through, and two dogs were out there fighting over one of our biscuits. They were fighting over which one should have it. Their owners had probably been killed by shell fire. They were simply strays. They were fighting over a biscuit to keep alive. I thought to myself, "Well, I don't know, there's two animals out there fighting for their lives, and here we are, two highly civilised nations, and what are we fighting over?" We were Lewis gunners. I was Number Two. Our Number One, Bob, who fired the gun, was looking for a Number Two. His Number Two had gone home on compassionate leave, and the sergeant in charge of us said, "Here's somebody has some training on the Lewis Gun. Here's a Number Two for You." I was to be in charge of the ammunition and the working parts of the gun. Bob told me, "You've got to do the job thoroughly and correctly. Our lives depend on it." We'd do alternate turns of four nights and three days in the trenches, then four days behind the lines to rest and recuperate. On 21 September, the night I was wounded, the battalion had been relieved at ten o'clock and we were going back over open ground to the support line. The shell that got us was what we called a whizz-bang which burst amongst us. The force of it threw me to the floor, but I didn't realise I'd been hit for a few minutes. The burning hot metal knocks the pain out of you at first but I soon saw blood, so I put a field dressing on it. Then the pain started. I didn't know what had happened to the others at first, but I was told later that I had lost three of my mates. That shell killed Numbers Three, Four and Five. We were a little team together, and those men who were carrying the ammunition were blown to pieces. I reacted very badly. It was like losing a part of my life. It upset me more than anything. We had only been together four months, but with hell going on around us, it seemed like a lifetime. I'd got this piece of shrapnel right in the groin. It was about two inches long, half an inch thick, with a jagged edge. I was taken to a dressing station and I lay there all that night and the next day, until the evening. The wound had been cleaned and they had smeared it with something to keep the lice away. When the doctor came to see me, he could actually see the shrapnel. "Would you like me to take that out of your leg?" he asked, but added quickly, "Before you answer 'Yes', there's no anaesthetic in the camp. None whatever. It's been used on people more badly wounded than you are. Yours is only a scratch." So I thought for a minute or two, and said, "How long will you be?" He said, "A couple of minutes." So I said, "Carry on." Four fellows grabbed me - one on each arm and one on each leg - and I can feel that bloody knife even now, cutting out that shrapnel. When he pulled it out, the doctor asked me if I wanted to keep the shrapnel as a souvenir. Officer or not, I swore at him, "I've had the bloody thing too long already. Throw it away!" The fellow in the next bed to me said, "If he writes anything in that book on the table, you're for Blighty." 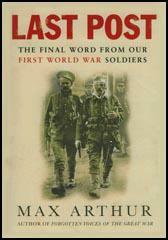 The word Blighty meant everything to us soldiers. I didn't believe him, but he wrote something in the green book, and some hours later somebody came in, called my name and number and I was sent to Rouen, where they put us in a warehouse. You could see the hospital ship from there, but it didn't sail that night. There were rumours of a submarine in the Channel, so we sailed the next day and came in to Southampton. Because of my wound I never returned to France. With war, Patch waited for October 1916 call-up and, by June 1917, was a lance corporal in France with the Duke of Cornwall's Light Infantry. Two weeks after the third battle of Ypres, Passchendaele, had begun on 31 July 1917, Patch duly went over the top. "Others were just blown to pieces," he would write in the 21st century, "it wasn't a case of seeing them with a nice bullet hole in their tunic, far from it, and there I was, only 19 years old. I felt sick." Impassioned yet cool, he saw weeks of horror; a dying comrade called, "shoot me" but immediately died with the word, "mother". Haunted by that, and shielded by a dead German, Patch, a crack shot, fired mercifully at a German's shoulder, but the man stumbled on, bayonet ready; an easy kill, but still Patch "shot him above the ankle, and above the knee. I brought him down. He called out something in German, I don't suppose it was complimentary". Then, on 22 September, Patch was badly wounded in the chest. Recuperating back in the West Country, he combined recovery with plumbing studies and met his future first wife, Ada. Chest pains precluded a return to France, but he was not demobilised for another year, not until after Armistice Day. Indeed, after 11 November 1918 he was on a firing range with other Tommies when a jobs- worth officer so riled them that there was a stand-off between his revolver and their rifles: "Had he not backed down, he would have been shot, there's no doubt about it." A brigadier, alert to the officer's attitude, vindicated them, but for a moment it had looked a close call. Starting up again after the war he had charge of 10 plumbers and 18 fitters when he reached 65, but was adamant that he was going to work no more. He and his wife enjoyed 10 years of retirement before she died, and a few years later he married Jean with whom he was asked to to visit the Normandy battlefield by a friend who had two seats going in his coach. He was driven to tears on Omaha Beach, thinking of the Americans he had known, and had no desire to go again. But at 92 he was asked to don a hard hat and dungarees to guide geologists from Bath University underneath Combe Down, where the disused quarries have been causing increasing concern about safety. He had not been down for 70 years, but was able to lead the way to one, which had been completed forgotten by the local council. It was after his second wife’s death and his admission to an old people’s home, aged 100, that the light outside his room prompted, as he lay in bed, a recurring nightmare about the flash of the bomb that hit his unit. Roundly declaring that anybody who claimed not have been afraid at the front was a liar (pronounced in his defiant West Country burr), he expressed thanks that he had never killed a man. No war was worth the loss of a couple of lives, let alone thousands, for what was nothing but “a family row”, he said, though he admitted he would have shot the Kaiser and Hitler to save millions of lives. As one programme followed another Patch became a new phenomenon of our age, a centenarian celebrity. He had a cider, Patch’s Pride, named after him, and was awarded an honorary degree by Bristol University, where he had worked on the Wills memorial 80 years earlier. He also received the Legion d’Honneur from the French government and was induced to meet an Alsatian who had fought on the German side at Passchendaele. He found him “a very nice gentleman”; they exchanged gifts of a bottle of cider and Alsatian biscuits, then attended the Last Post ceremony at the Menin Gate. His second wife and the sons of his first marriage died. When he went into the old people’s home he found a girlfriend in her eighties but the thought of the fuss the press would make put him off marrying again. It was the loss of his three friends on the night of September 22 almost 90 years ago that haunted him. “Those chaps are always with me. I can see that damned explosion now,” he would say.